Charlotte’s Web Holdings Inc. (CWEB:CSE: CWBHF:OTCQX) (CWEB) and Elixinol Global Ltd. (EXL:ASX; ELLXF:OTCQX) are pioneers in hemp/CBD. Both are fast growers. 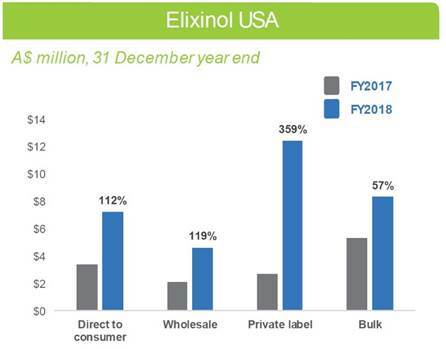 Elixinol, the fastest over the second half of 2018, has new, cutting-edge products and a lower relative valuation. This balances with CWEB’s stronger name recognition and larger retail sales base. CWEB’s Q4 sales rebounded after a hiccup in Q3 and had solid Q/Q sales growth of 21%. Both companies have positive EBITDA, which must be a shock to cannabis investors, with what we believe is a superior business model to cannabis growers. (Disclosure: A director of Fincom Investment Partners is a long-time CWEB reseller). 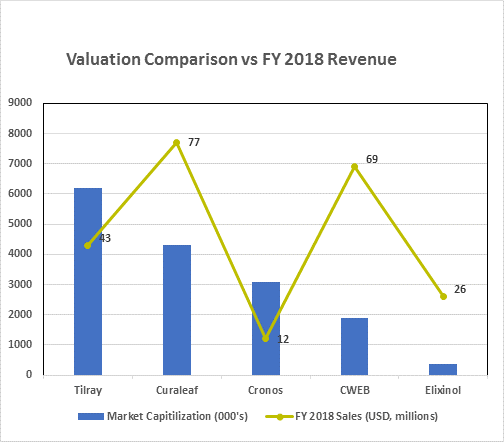 We continue to suggest fair valuation for Elixinol remains one-half of CWEB’sdiscounted 20%. CWEB’s sales are more than 2X, which equates to US$5.95. We visited the Elixinol booth at March’s Expo West (Natural Products industry biggest trade show) (our 32nd year) observing a buzz of activity; there was a continual flow of interested buyers, while management kept heading off to private meetings with Big Box retailers. We hope to see positive news flow over coming months. Elixinol is completing its expanded production facility in Colorado, with capacity similar to Charlotte’s Web. We believe production capacity and years of actual production experience is the edge for both companies in a sea of competition for “Big Box” attention. Elixinol’s 2018 sales were US$26 million, up 121% annually. CWEB’s were $69 million, up 74% annually. 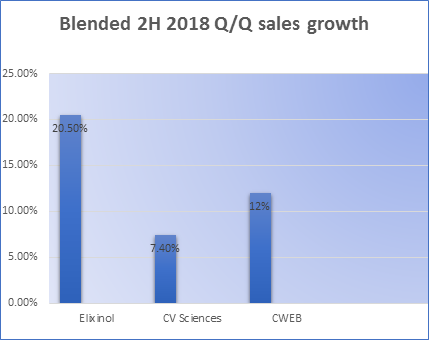 Much of Elixinol sales are in lower margin private label, which becomes a strategic advantage since neither CWEB nor CV Sciences can boast significant experience with private label, third party or bulk CBD sales. Elixinol, perhaps, has a “leg up” on branded partnerships, building the “powered by Elixinol” brandthe brand behind the brands. We believe this is a stronger competitive “moat” than just selling through fickle retailers. We suggest the CVS news is the spear’s tip, and we expect 2019 will continue to be an exciting year for CBD. We have long argued CBD (the cannabidiols, a non-intoxicant) is a larger marketand a better investmentthan cannabis. We believe CBD will become a health standard, available in multiple OTC forms and routinely sold by mass retailers, like aspirin. The OTC market for pain relief, stress and sleeping issues is massive. CBD is a perfect fit. Many of the large Canadian cannabis companies have announced intentions to enter the U.S. CBD space. These include Canopy Growth (CGC), which has talked up a $150 million investment into U.S. hemp farming and CBD production. It is not afraid to spend money. We suspect Canopy is most likely a CBD-brand buyer once it figures out that farming is not where the big bucks arethe $5 billion cash infusion from Constellation Brands came from selling and branding, not hops and barley farming. Cronos (CRON) has a partnership with Ginkgo Bioworks that may (someday) produce lower-cost custom yeast strains capable of producing cannabinoids. We hope this works outsomething betterCRON Q4 cannabis sales of US$4.2 million hardly seem to justify a $3.3 billion valuation. Even if Marlboro invested. The Canadian cannabis crowd are smart people and surely see the CBD opportunity. It’s real. It’s happening now and it’s happening all across the U.S.
We expect more CBD-related listings in the U.S., but investors can own two quality producers now. We also suggest investors recognize CBD is not software. Planting crops, building production facilities and selling into a pipeline that already has plenty of quality product is not easy. It is going to take at least two years, at the earliest, before a new player can develop into serious competition. 2019 remains opportunistic for existing CBD pure plays. Given the challenges, we think cash and stockrich cannabis companies would be wiser to try and buy CBD producers…with their inflated stock. Charlotte’s Web was “launched” by a 2013 CNN documentary and has been growing since. Elixinol founder/CEO Paul Benhaim has worked in the hemp industry since 1991. There are now hundreds of wannabe CBD start-ups; we avoid them because we doubt they have staying power or pricing power. Competition will increase. The vitamin and “wellness” industry attracts charlatans like moths to flame, a risky combo when combined with the penny-stock crowd. Be careful. Other CBD producers include CV Sciences (OTC: CVSI), and we own some shares (from a low 2018 price point) in case something happens. We have been disappointed with management. Retailers complain about poor customer service; investors complain management ignores them. Quarterly sales growth has fallen off a cliff, down to just 4% in Q4. Its NASDAQ application has sat DOA now for nine months, which means there has to be something wrong? Plus, management still bizarrely insists in dividing the company, confusing investors and wasting half the presentationas a pharmaceutical developer. It has no patent, which the U.S. Patent Office keeps denying. To us, the drug dream is presently “worthless” and only heavily promoted as some sort of ego trip. CWEB sales are roughly split between e-commerce and independent retailers, while about two-thirds of Elixinol’s U.S. sales are in private label and bulk. One reason why investors should consider Elixinol as part of a sector-related portfolio: new, exciting products. Elixinol’s line of water-soluble CBD is the fruit of years of research, and leads the industry. 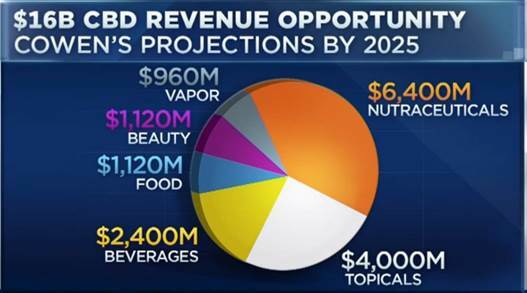 Investors may recall the early hype about cannabis/CBD-laced beverages, but soon realized the challenges working with an oil-based product. Parties involved recognize the need to develop a working solution. Water-soluble seems better. Elixinol is already there. We think the older done-it-all group has less interest in spending the day “stoned,” with better interest in improved health. Tens of thousands take CBD daily, even if they often do not “feel” anything. 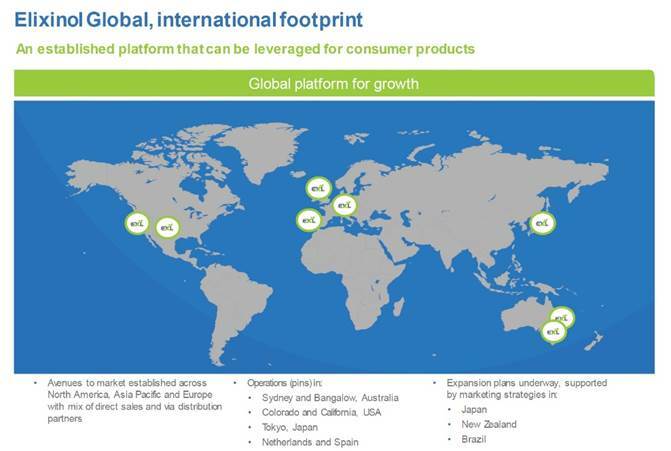 Slides like those (below) could help CBD to grow into millions of users. Important Disclosure: Fincom Investment Partners and related accounts have purchased, and continue to purchase, Elixinol shares in the open market and also owns shares of Charlotte’s Web. In addition, a Director of Fincom Investment Partners has been an executive and business owner in the nutrition industry for over 35 years, developed numerous close relationships in the industry, and has a business relationship with CV Sciences and Charlotte’s Web. Fincom Investment Partners has started helping Elixinol, as a consultant. We have introduced distribution relationships, key management personnel and made other suggestions, based on our long and direct experience in the retail and wholesale nutrition industry. For this we are receiving a modest monthly consulting fee. We are not insiders and our investment opinion continues to remain our own. Prices as of 3/28/2019. This report is for informational purposes only and is not a solicitation of any security purchase or sale. We use a 0.71 conversion rate for Australia to USD and 0.75 for Canada. Opinions expressed herein by the author are not an investment recommendation and are not meant to be relied upon in investment decisions. 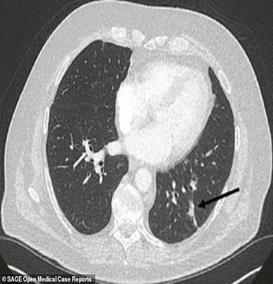 The information upon which this material is based was obtained from sources believed to be reliable, but has not been independently verified. Therefore, Fincom Investment Partners cannot guarantee its accuracy. Do your own due diligence. 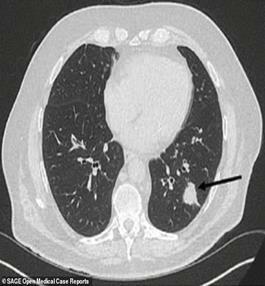 Any opinions or estimates constitute our best judgment as of the date of publication, and are subject to change without notice. We recommend investors conduct thorough investment research of their own, including detailed review of the related Companies’ filings, and consult a qualified investment adviser. Fincom Investment Partners and its officers and directors own shares in the securities mentioned in this report and may buy or sell shares at any time without prior notice. Fincom Investment Partners has a consulting relationship with Elixinol.